Bequests and planned gifts are a vital source of future income for the Foundation, assuring our continuing ability to support library programs for future generations. For more information about planned giving, email or call Julie Saxenmeyer at 410-887-3282, or contact your estate attorney or other financial counselor. You can use our Planned Giving Confidential Reply Form to let us know of your plans. Include the Foundation in your will. You can designate a specific dollar amount or a percentage of your estate. Consider using assets for your charitable gift, such as stocks, bonds, CDs, real estate, art or jewelry. Download a stock donation form. Name the Foundation as the beneficiary of your pension plan or Individual Retirement Account (IRA). Name the Foundation as the beneficiary of a new or existing life insurance policy. Remember loved ones with a memorial gift to the Foundation. In 2011, the Foundation received a $475,000 bequest from the estate of Peggy Peterson, a librarian retired from Baltimore County Public Library. With this gift, the Foundation started an endowment fund to support library programs and projects. The Margaret Peterson Circle was created in honor of Peggy’s generosity. The circle includes those who have made an outright gift to the Foundation of $10,000 or more, or have given notification that they have made a lasting commitment to the Foundation with a provision in their will or estate plans. 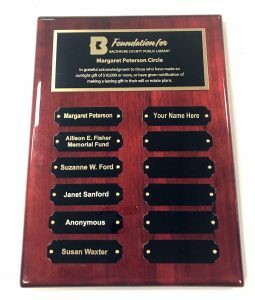 Please let us know if you have included Foundation for Baltimore County Public Library in your estate planning so that we can honor you as a part of the Margaret Peterson Circle and add your name to our plaque, which hangs in a place of honor at the Administrative Offices of Baltimore County Public Library. Peggy Peterson at her retirement party in 1986. 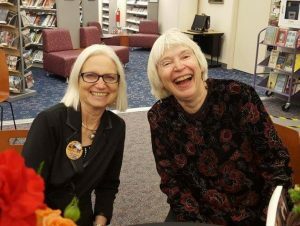 Margaret "Peggy" Peterson was a librarian whose 23 years with Baltimore County Public Library made her a familiar face at the Reisterstown, Catonsville and Pikesville branches, and at the Administrative Offices in Towson. Born in West Baltimore, she moved to the county and found her calling in the stacks at the Reisterstown Branch when she was nearly 40 years old. In 1965, she became a member of the first class of the Library Associate Training Program in Maryland. It was established to meet the demand for highly trained public librarians in the rapidly growing Baltimore area public library systems. Over the next 15 years, she worked in the Catonsville and Pikesville branches. In 1981, she left the Catonsville Branch and moved into administration in Towson, where she selected books for the entire library system. 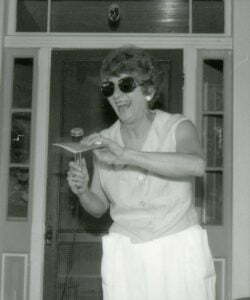 Peggy retired in 1986, and passed in 2006. 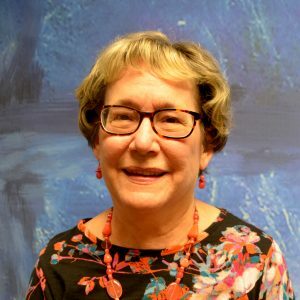 "Peggy considered her career as a librarian with Baltimore County a life changing experience," said Lynn Wheeler, a close friend and former Baltimore County Public Library assistant director. "She left her money to the Baltimore County Public Library because they brought great joy and meaning to her life, and they help people connect to the books and information that would make a difference in their lives." I support the Foundation because I have so much gratitude and appreciation for Baltimore County Public Library! I worked in the administrative offices of Baltimore County Public Library for the last 10 years of my career, after 30 years in banking. The 10 years at the library were the best and most rewarding of my working life! My job allowed me to work with all departments and branches of the library. That allowed me to gain a tremendous appreciation for the contribution the library makes to its communities. In addition, my coworkers were wonderful and some of them remain very close friends. I was so proud to work for the library, and am still proud to say that I did. When I told people that I worked at the library, their faces lit up with happy memories of their experiences there. I must say that people rarely had that reaction in the years I worked in banking! I support the Foundation because I want Baltimore County Public Library's excellence as a source of knowledge and pleasure, and as a community place, to continue way into the future. Janet Sanford (on the right) with Baltimore County Public Library Director Paula Miller. I joined the Peterson Circle because I believe that all children and adults have the right to have access to books and other reading materials of choice for free forever. The Foundation funds many worthy programs and projects, such as BC Reads, Summer Reading, many varied programs around the systems and the Storyville locations. I support all these activities because they benefit children and adults, contributing to early learning, enjoyment and growth. The Foundation provides important support to the library that makes Baltimore County Public Library an even better resource for all.